Have you ever read the book James and the giant peach? 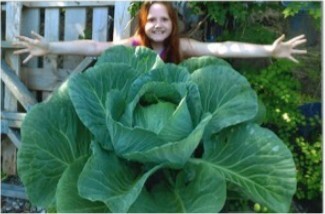 Well here at Thelma Jones we have a real life alternative version by Mari Jayne Paulk with her giant cabbage. Given a tiny cabbage plant for a project in Mrs. Ramos' third grade class last year, she took it home to grow. When asked how she grew her cabbage so large, she didn't plant magic green "crocodile tongues" like James, but gave this account. "At first I was keeping it at my window, then I replanted it outside and it was hanging from the roof of the patio. When it grew too big for the patio, we moved it to a huge pot. Everyday I looked at it for bugs and made sure it wasn't wet. Then at night (two times a week) I would water it until it leaked out the bottom. Eventually the cabbage was big enough to dig out of the pot, it was 7 pounds with the leaves. That night my mom made meatballs wrapped in cabbage leaves and we ate it for dinner. It was good! We feed the leftover leaves from the cabbage to our chickens." Mari Jayne is now a 4th grader in Ms. Sonzogni's class and we are looking for more great things from her this year.